Unifor President Jerry Dias: "We have been absolutely straightforward with the automakers that we want investment in Canada. This shows that to the other companies." TORONTO -- A tentative labor deal with General Motors shows the onus Canada's autoworkers union will put on new investment in upcoming talks with Ford Motor Co. and Fiat Chrysler Automobiles, the union's head said today. The deal includes pension concessions by the union, Unifor, and a rare shift in work from Mexico to an Ontario facility, averting a strike that would have shut some of GM's Canadian plants and affected some top-selling vehicles, such as the Chevrolet Equinox. Under pattern bargaining, the first deal typically sets the tenor for negotiations and a second target company will be selected shortly. 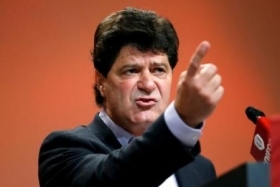 "We have been absolutely straightforward with the automakers that we want investment in Canada," Unifor President Jerry Dias said in an interview. "This shows that to the other companies." Unifor wants Ford to keep its engine plant operating in Windsor, Ontario, and called on FCA to upgrade an aging paint shop at its Brampton, Ontario, assembly plant. The GM deal, reached early today, will ensure "hundreds of millions" in investment, Unifor said, including new jobs and higher wages for new hires. Union members will vote on the deal on Sunday. The union agreed to a pure defined-contribution plan for new workers, the first such plan under the master agreement that covers most assembly workers at GM, Ford and FCA. Veteran employees have defined-benefit pensions and those hired since 2012 have a hybrid plan. The deal is positive for the Canadian auto industry, which has steadily lost jobs to lower-cost centers in the southern United States and Mexico, because it secures GM investment but also creates a more competitive labor structure, said Flavio Volpe, president of the Automotive Parts Manufacturers' Association, which represents Canadian suppliers. "This is the exact story Canada needs to tell to regain our momentum," he said. GM Canada said it will look for government funding to support its "significant new product, technology and process investments" in Oshawa and at the company's St. Catharines powertrain plant. GM spokesman Tom Wickham declined to give further details. The federal government recently agreed to a request by automakers to convert loans from its Auto Innovation Fund into grants, which helped both sides reach a deal, according to a source directly involved in the talks. Canada industry ministry spokesman Philip Proulx declined to comment on specifics on funding, adding "we are in the process of reviewing the terms" of the fund. The Ontario government said it will "provide further information regarding potential government support at the appropriate time." Dias did not say what vehicle model or models would be built in Oshawa, but said the plant would become capable of producing both cars and trucks. It now builds cars. He said some engine production would shift from Mexico to St. Catharines, the first time he can remember production moving from Mexico to Canada. A four-year contract covering some 20,000 Canadian autoworkers at the three automakers expired Monday. Only GM workers were in a legal strike position today.